After primary esophageal atresia repair, the commonest and most worrisome complication is an anastomotic leak. Following this is an anastomotic stricture, which may be contributed to by gastroesophageal reflux (GER). Tracheomalacia and recurrent and/or missed tracheoesophageal fistula (TEF) are difficult to deal with. Early and late dysmotility cause problems, as well as anastomotic foreign body obstructions. 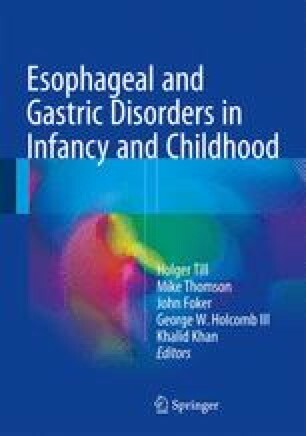 The complications of esophageal replacement are related to the actual graft, the most serious of which is its viability. The next commonest complication is usually found at the esophago-replacement anastomosis (usually in the neck). The complications from each type of replacement (gastric transposition (pull-up), colon, gastric tube, jejunum) are presented in order of importance (i.e., quantity and quality). This section focuses on the disadvantages, as they are usually the precursors of the postoperative complications.